PM Netanyahu says Iran is “the greatest darkness” threatening the world, promises Israel will be the “light to the nations”. 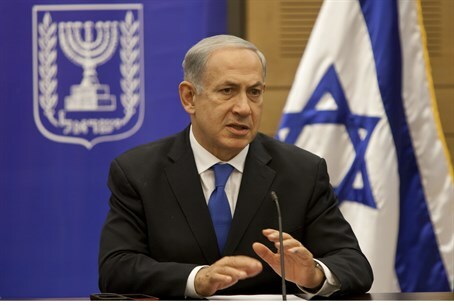 Relating to the holiday of Hanukkah, also known as the Festival of Lights, Prime Minister Binyamin Netanyahu on Thursday called Iran “the greatest darkness” threatening the world and said that Israel would be the “light to the nations” when it came to Iran’s nuclear program. The comments were made at the Western Wall, where Netanyahu lit candles for the second night of Hanukkah. “We are now holding contacts with the U.S. and the P5+1 governments, with the major powers, regarding the type of agreement that could banish this darkness, and it must, in the end, lead to the result of the dismantling of Iran's military nuclear capability,” declared Netanyahu. “I believe in speaking the truth and standing up on important principles in order to ensure global peace and our security, and of course, our peace,” he said. “I believe in this because I recall something the Lubavitcher Rebbe told me when I went to the UN. He told me, 'Remember that even when you are in a world that is all dark and you light one candle, one candle of truth, the light – the precious light that this candle gives off, is seen from afar,’” added Netanyahu. Netanyahu has been very vocal about Israel’s rejection of the deal reached with Iran in Geneva last weekend. “As we learn more and more details about the agreement that was achieved last night in Geneva, it becomes increasingly clear how bad and dangerous this agreement is to the world, the region and Israel,” he said hours after the deal was signed. “Iran is receiving billions of dollars in eased sanctions without having to pay any real price. Iran is receiving written approval to violate UN Security Council resolutions. To a large degree, this agreement rescues Iran from the pressure it has been under and also gives it international legitimacy to continue its nuclear program. This is a bad agreement." Netanyahu’s position has put him at odds with the United States, to the point where, according to one report, President Barack Obama was refusing to accept his phone calls. On Thursday it was reported that Obama had asked Netanyahu to “take a breather” from his criticism of the deal.